He’s laughing at us, not with us. Several news outlets are reporting that Ron Paul has been caught schmoozing with people on the racial right and parting them from their money. They’ve also confirmed what anybody paying attention has known for years: that a huge segment of Ron Paul’s supporters are racialists. This is a big scandal for the mainstream media, confirming their worst suspicions about his motives. If, however, one moves beyond the revelation that Ron Paul is entangled with “racists” and actually lifts the sheets to spy on the nature of that entanglement, the real Ron Paul scandal emerges: Ron Paul is a libertarian ideologue without a shred of racial sentiment who’s been effectively redirecting White anxiety into a libertarian dead end for decades. To summarize, a Jewish ideologue named Murray Rothbard assembled a team of White gentile libertarian ideologues which included Ron Paul who went on to repackage ideological libertarianism with the imagery and innuendo necessary to exploit the growing racial anxiety of White Americans. The Ron Paul newsletter became a vehicle for this, seducing racialists with promises to rip the food stamps, health care, education, and everything else from “those people“: the (disproportionately Black) underclass. States’ rights were another opportunity to dog whistle to racial anxieties within the libertarian construct. Slowly and steadily, this faction which began as a small splinter group from generic libertarianism devised a rocket to launch themselves far above the movement they originally belonged to. It was a strategic partnership of sorts with two halves: White frustration as the rocket fuel and race-blind libertarian policies as the warhead. For decades, Ron Paul has been siphoning off millions of dollars and millions of votes from those who are concerned about the fate of White people in this country for the cost of some winks, some nods, and probably a white lie here or there behind closed doors. We’ve been cuckolded for decades by a man who favors increasing the rate of non-White legal immigration , favors granting amnesty and work permits to illegal immigrants, favors toppling the trade protections American workers need to compete with third world sweatshops, favors constructing the monetary system in a way which favors the wealthy oligarchs, and opposes–across the board–any and all efforts to deport the invaders or defend the citizenry as fascist. It’s not that Ron Paul’s consciously anti-White. He doesn’t see white, yellow, and brown people. He sees the world in only one color: green. He’s an admirably persistent and consistent Austrian economist, but the issues which aren’t within the scope of his radically mercantile worldview are for sale. If he’s standing in front of Latinos, he’s an open borders anti-law enforcement libertarian. If he’s standing in front of Southerners, he’s a neo-Confederate secessionist libertarian . If he’s standing in front of Black people, he’s an anti-racist anti-War on Drugs libertarian . If he’s standing in front of Zionist Jews, he’s pro-Israel  libertarian. When Ron Paul was palling around with racialists, he was surely a crypto-racialist antisemitic libertarian. Either Ron Paul contains multitudes of self-contradictory beliefs, or he’s a libertarian who pays lip service to whoever will listen to him, vote for him, or mail him a check. 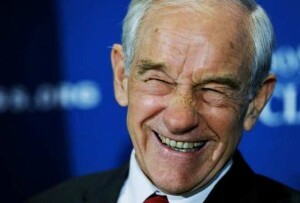 Is the Latino who believes Ron Paul feels his pain of being a downtrodden illegal immigrant the useful idiot? Is the Black who believes he feels his pain of being persecuted by a wealthy White system the useful idiot? Are we, the racists who believe he feels the pain of being driven out of our communities by a hostile underclass the useful idiots? It’s a trick question: We’re all useful idiots. Everybody who cares about something greater than economic theory yet actively supports Ron Paul with time and money is a useful idiot. There’s an argument to be made for passively voting for him as the lesser evil in elections, especially given how his ideologically libertarian opposition to military imperialism. But there’s a subtle yet important difference between riding the tiger and feeding it. Ron Paul’s not the problem, as a faction as desperate and gullible as our own is bound to get fleeced in one way or another. You can’t con an honest man, and our own fantasies about having an “undercover lover” in the halls of power were tempting illusions. While we imagined the deception to be on all the rest of Ron Paul’s supporters who didn’t believe Ron Paul was a racialist, the deception was actually self-deception and the mark was actually us. Like the thousands of people who’ve been taken by 419 scams, we got giddy about scoring big dividends on our risk-free investment. Like a good share of those people, a good share of us will guard our egos by doubling down on self-deception, insisting that Ron Paul is still our man in the system despite a large and rising mountain of evidence to the contrary. There are many lessons to be learned from this humiliating episode (namely about the importance of securing our internal communication), but the most important lesson is to stop entertaining the illusion that we can sneak up on our enemies with clever “implicit” angles. Our enemies are smarter than we are. Our enemies are organized more effectively than we are. Our enemies outnumber us. The one face card we have in this struggle is that we and we alone are the true representatives of the interests of the White American people. They’ve made it difficult to play that card, but it’s the only card we have. We should invest our time and money in figuring out how to play it, not in Murray Rothbard’s anarcho-capitalist fantasy of a world devoid of nation-states strong enough to curb his tribe’s limitless appetite for wealth and power.